Weaving is one of the oldest skills known to humans, dating back to prehistory. India has a glorious past in the production of textiles and was especially renowned for printed textiles. The use of printing blocks in India dates back to 3000 B.C., and some historians are of the view that it may have been the original home of textile printing. Evidence of Indian textile trade in ancient times has been recovered from China in the East to Italy in the West. 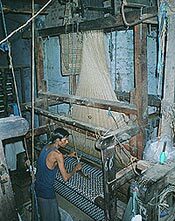 During the mid-19th century weaving was mostly done with handlooms. 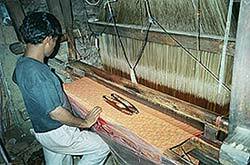 Weavers had to undergo a complex process of maintaining designs in the textile. During the Industrial Revolution in Europe, when everyday entrepreneurs were coming up with new inventions, Joseph Marie Jacquard, a weaver and entrepreneur from France, realized that weaving tapestry was a delicate and repetitive process. In 1804-5, he designed an improved loom, now known across the world as the jacquard loom. The functioning of the loom was governed by a series of punch cards. Interestingly, this technology later laid the foundation for the development of computers. The jacquard loom was introduced in India under the British and soon became the preferred choice of weavers as they could create complex designs with much less labor. It also reduced the cost of cloth and brought it within the reach of the lower classes. 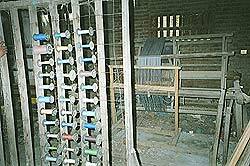 Today, the jacquard loom is used in various parts of India (the main centres are Delhi, Jaipur, Benaras, Kanchi, Kolkata, Howrah and Baluchari, Hubli and Mangalore) to produce cloth for products like tapestry, upholstery, saris, shawls, scarfs and other similar apparel. Jacquard Machine Fitted Loom: This is the main tool for jacquard weaving. Many of these looms are actually older handlooms converted into jacquard looms by fitting a jacquard machine atop the older loom. 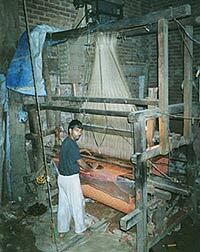 Taana (or Warp) Machine: This machine is used for preparing the warp roll. It contains a big, hollow wooden frame that is octagonal and cylindrical in shape, with a vertical wooden frame that contains the rolls of the thread used to make the warp. This machine, like the loom, is worked by hand. Charkha: There are two types of charkhas. One is the older model, which is smaller and looks very similar to the one used by Mahatma Gandhi for spinning khadi. The other is a metallic one, is much larger and has twice the capacity of the wooden charkha. Shuttles: These are smaller wooden blocks that are pointed on both sides. 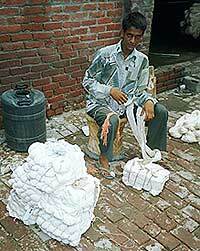 They are hollow from within and contain the roll of the thread that is used for the weft or taana. They travel between the threads of the warp with the pull of the strings attached with the frame of the loom. This provides a catapult effect, which makes it shuttle across the warp on the sill of the frame, across the warp threads. They get their name from this process. Since the number of products manufactured using jacquard weaving is large, there exist slight differences in the process as per product specifications. 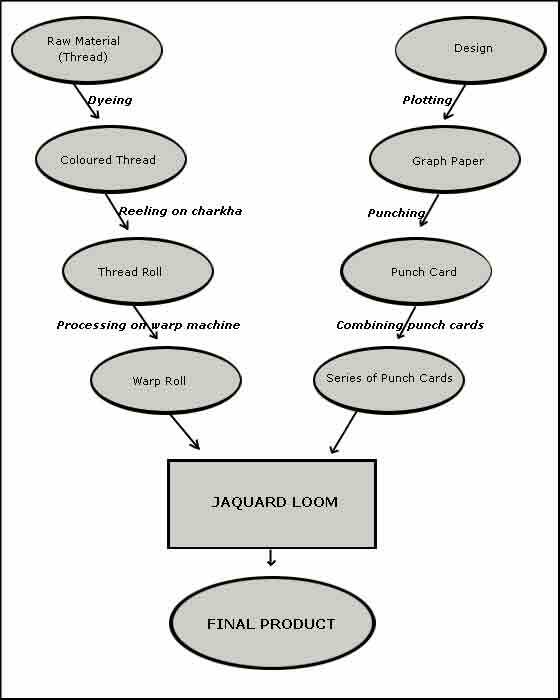 Procurement of Thread: Jacquard weavers purchase thread from dealers on a wholesale basis. There are two types of threads used. The first is the one used for the warp (taana), the lengthwise threads attached to a loom before weaving begins, and the other is for the weft (baana), the yarn that is shuttled back and forth across the warp to create a fabric. The width of weft is of 48 inches (122 cm). The warp normally runs into around 100 m, divided into two portions of 50-51 m each. For the warp, 2/40 cotton threads are used, and for weft 2/10 . These threads are purchased in the form of bundles. For weaving 100 m of cloth, four bundles of thread are required for the warp and six for the weft. The thread, which is the main raw material for the process, is readily available in the market and is supplied to loom owners at a wholesale rate. Dyeing of the Thread: Four types of dyes are normally used for coloring threads. These are, procen dye (which fades easily and therefore is used in cheaper clothes), direct dye, wet dye (which is a more or less permanent dye) and napthol or reactive dye (which is used for red, maroon and orange colors). The bundles of thread are first opened and then tied in the middle so that they do not tangle during dyeing. Water is heated in tubs 5×4×4 feet big, in which the dyes are added. The threads are then soaked into these dyes, giving time for the dye to color the thread. After this, the bundles are taken out and are dried in the shade. 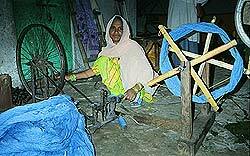 Making Rolls: Reeling is done using a charkha machine. This is normally done by the women of the household. The threads are put in the form of a roll, or gitta, as it is locally called. The charkha that is used may be a big, metallic one or the small wooden one. 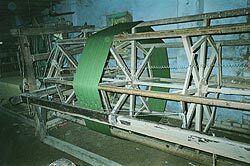 being wound around the warp roll; and the other is a big wooden vertical frame on which the rolls of threads of different colors are put from where they can be attached to the octagonal frame. This is a hand-driven machine and it provides the basic requirement for the loom, the warp roll. Normally, threads of three or four colors are used for preparing the taana or warp, depending on the design desired. a set of needles, it pushes the requisite hooks backwards. The needles where the card is punched remain unaffected, while the other needles are pressed and the hooks associated are withdrawn, leaving the threads in the background. Thus, the threads in the hooks whose needle are not pressed by the cylinder due to the hole in the punch card come forward to be a part of the weft and the rest remain as they are, allowing for the complicated designs on the fabric. technician are not regulars in the jacquard loom team. The weaving prcess requires great skill as the weaver has to constantly keep pedaling with his right leg to operate the jacquard machine. At the same time, he has to pull the string that controlls the shuttle, which flies over the wooden sill of the loom, taking the yarn of the weft across the threads of the warp, thus progressing the process of weaving.